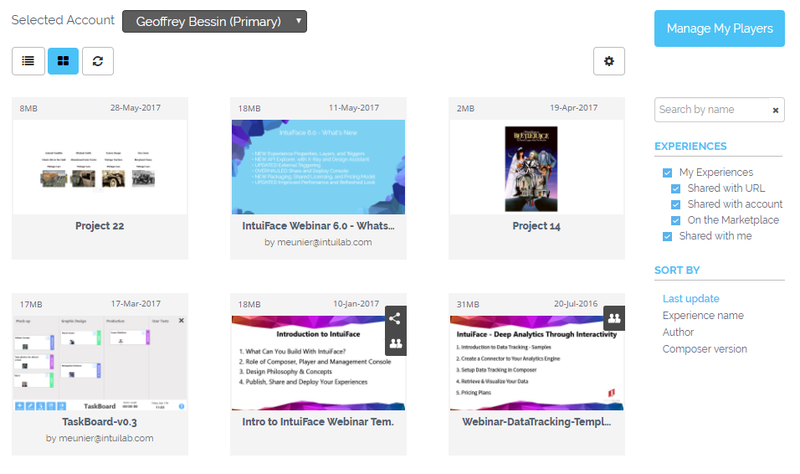 Experiences saved to a cloud storage account using Intuiface's publishing capability can be shared with colleagues and clients simply by entering their email addresses. 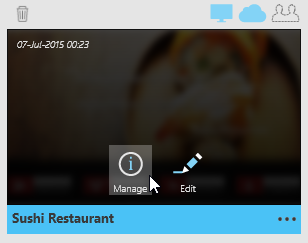 Shared experiences appear in Composer's and Player's Experiences panel and can be downloaded automatically. 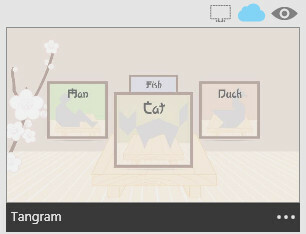 All Composer plans can be used to publish and share experiences. Select the "Share with account" tab and then enter the email address of every person with whom you would like to share this experience and specify the level of sharing privileges you want that target account to possess. For information about sharing levels, see this article. You can have more than one email address on the same line. Separate these email addresses with a semicolon. 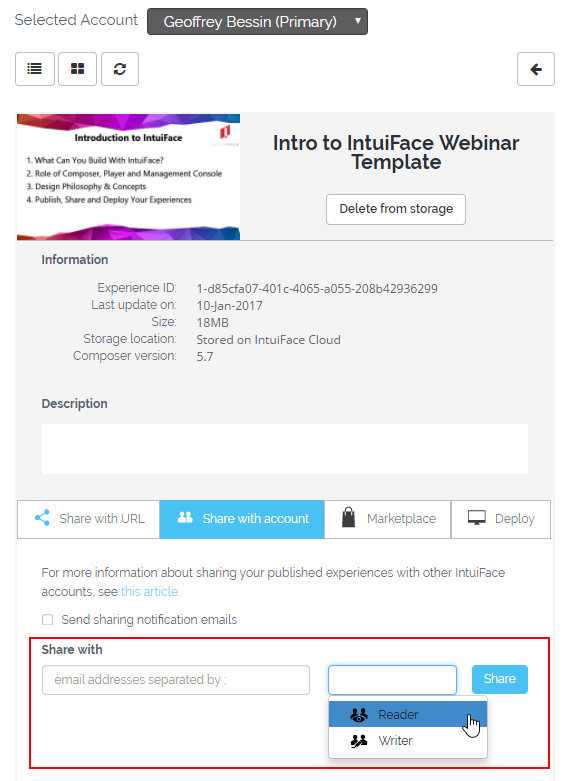 Intuiface will automatically send an email to each person in your share list if you select the "Send sharing notification emails" checkbox. One of two emails will be sent to each listed address. Both emails alert the recipient to a shared experience. 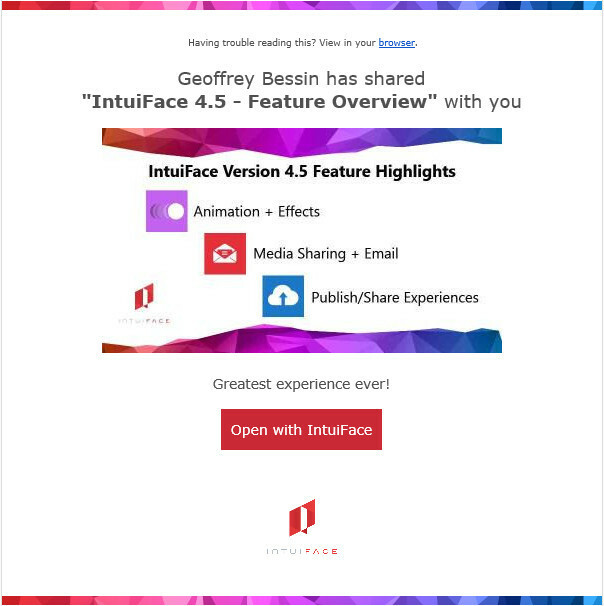 if the email address is already associated with an existing Intuiface account, the email will contain a button that launches Composer. if the email address is not associated with an existing Intuiface account, the email will contain a button that opens the Intuiface account registration page in their Web browser. If you have a primary account in possession of secondary accounts, you can share experiences published by secondary accounts by selecting that secondary account from the dropdown list at the top of the Experiences view. Consider selection of the secondary account in that dropdown to be equivalent to logging in as the secondary account. Shared experiences first appear in the Composer and Player Experiences panel with the icon in the upper right-hand corner of their representation. This icon tells you this experience has not been downloaded. Composer: To download a shared experience, click its thumbnail image. The experience will be saved into the folder C:\Users\[your account]\Documents\Intuiface. Player: To play a shared experience, click its thumbnail image. This will initiate the download process if necessary and then run the experience. 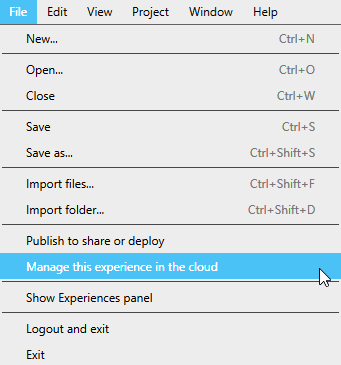 If you wish to unshare an experience, open the experience's information panel in the Share and Deploy console, select the "Share with account" tab, and click the 'x' to the right of the email address. This will remove the reference to your experience in the other user's Share and Deploy console and in the Experiences panel of their Composer and Player installations. For a detailed look at what happens at each possible sharing level, see this section. Writer: Publishing will no longer be possible. The Writer can save changes to a local version but the original experience can no longer be accessed or overwritten. Reader: The experience can remain open for as long as the Reader would like but, once closed, it cannot be reopened.